Compost or nutrient teas can be made in two different ways and derived from a variety of nutrient sources . All have something to offer but can vary considerably in macro-nutrients(NPK), trace elements and the number of beneficial microbes present. While some are high in both beneficial microbes and nutrients, other have low nutrient value but are high in beneficial microbes. This leads to some sources being better prepared as aerated teas rather than passive teas and vice versa. The first, are simple passive teas that extract the water-soluble nutrients from natural fertilizers. Keeping in step with simplicity, the first is a simple tea often call passive nutrient tea. 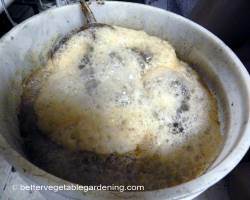 This method extracts the water-soluble nutrients from an organic source making a very useful liquid fertilizer. 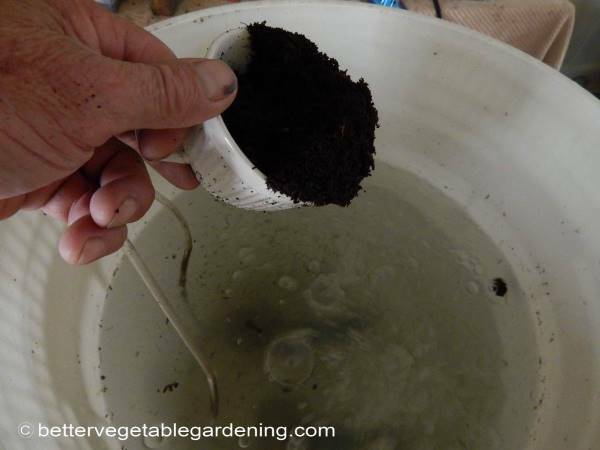 Many gardeners prefer these passive teas because they are simple to make and use. The second method, using the same fertilizer or organic nutrient source, is an aerated compost tea. Instead of brewing teas just for the water soluble nutrients, this method involves activating colonies of beneficial aerobic bacteria and fungi that are naturally present in many organic fertilizers. This method of tea making is a little more complex. By oxygenating the liquid, the beneficial organisms, bacteria and microbes naturally present in many organic fertilizers are activated giving the solution soil enhancing properties far beyond just the nutrients present. In either method the organic nutrient source can be put into some sort of permeable bag to eliminate fine particles in the solution. This is optional and depends on whether you are going to use the finished liquid as a soil drench or spray it as a foliage feed. It is important to use chlorine free water when making, mixing and diluting any nutrient tea or liquid manure fertilizer . Chlorinated water kills bacteria, both good and bad. Beneficial bacteria are much of the benefit gained from both passive and aerated nutrient teas. Either use rainwater or if using chlorinated water, let it stand for 24 hours so the chlorine can evaporate out. 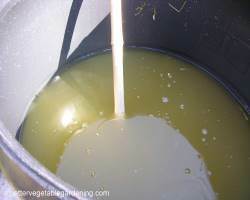 Put enough chlorine free, or rain water, into a bucket large enough to allow mixing without spilling over. Add to the water the amount of the particular nutrient source you are using. Leave the solution to steep for 3-10 days depending again on the nutrient source. If you stir your brew daily it helps get more oxygen to the mix, even in passive teas there is still some aerobic action taking place. Use the water to fertilize your seedlings and plants at all stages, can be used as a foliage spray, soil drench or added to the compost heap to speed up the decomposition process. For much more detail follow the links below for making the many different teas available. Worm tea is a natural liquid fertilizer made by steeping worm castings in water. A passive tea used as a foliage spray, soil drench and seedling fertilizer. Alfalfa hay tea page is a Slideshow on making a passive tea, alfalfa is one of the best of the many nutrients available for vegetable gardens.